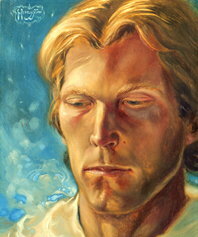 Portrait of Bradley Steffens by the late Brian McGovern, painted in 1976. Most of these poems originally appeared elsewhere: “I Wake to the Sound of Dinosaurs,” “Next Life,” “Love Potion,” “The Former Cryptographer,” “Lakeside Diversion,” and “Poetry Is A Magic Trick,” Loonfeather; “Deity,” “Ninja,” “New Year’s Day, 1962,” and “Preoccupied,” San Diego Writers’ Monthly; “Sub-Zero Christmas Day,” “Checker,” and “The Fallen Eucalyptus,” Sidewalks; “Two Weeks Ago,” “Auriga,” and “Centaur’s Visit,” Crosscurrents; “Succubus” and “Driving Through Yellowstone at Midnight,” The Bellingham Review; “Postville, 1943” and “Crocus Hill,” Farmer’s Market; “Sunset, 1967” and “The Twelve-Foot-Long Iguana,” Stone Country; “Automobile” and “From An Eighteenth Century Painted Tile,” River Bottom; “The Melting Point” and “Orange,” The Princeton Packet; “Satyr In The City,” The Worcester Review; “Magic 8-Ball,” The Birmingham Review; “Communion,” Black Buzzard Review; “1957 Waterloo City Championship,” The Lake Street Review; “Teaching Ezekiel To Wish,” Embers; “Muncie, 1973,” Blue Unicorn; “Snack’s End,” Plains Poetry Journal; “Getting The Letter Right,” The Ball State University Forum; “Watching West, 1970,” The Eastsider; “At the Beach,” Earthwise; “The Steppingstones To Go,” The Hartford Courant. I thank the editors of these periodicals for their encouragement and support.